Circumnavigating the globe on foot sounds like a tall order - requiring commitment of years of one’s life, some serious logistics planning, and an unshakeable determination to put one foot in front of the other for as long as it takes. 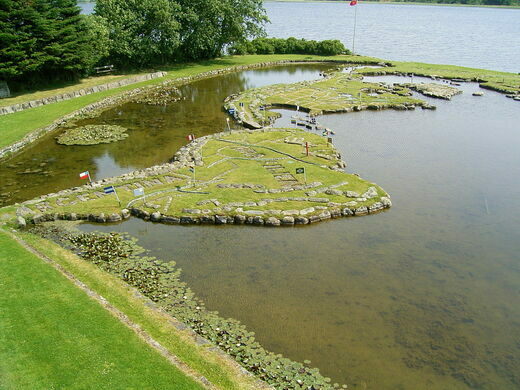 For those keen on the idea but not the long haul, there’s Verdenskortet (Map of the World) in Denmark. Bog body on display in Danish church. At the Verdenskortet attraction, visitors can march across all the world’s countries in a matter of minutes and then have a cup of coffee and a pastry at the adjoining cafe. Amazingly, the outdoor atlas was constructed entirely from soil and stone. Even more amazingly, it’s all the work of one man. Søren Poulsen was born in 1888 on the property and moved to the United States when he was a young man. After 20 years abroad, he moved back to the family farm on the banks of Lake Klejtrub. Following a failed orchard grove venture, he turned his attention in 1944 to the project that would consume him until his death at 81 years old in 1969. Always interested in geography, Poulsen decided to lay out the entire world through shaping a small peninsula on the lake. He did so with the use of a few simple tools (a wheelbarrow, a pushcart, handtools) and a whole lot of ingenuity - some of the stones he single-handedly hauled to the site weigh more than a ton. The finished map measures 45 by 90 meters, and is entirely to scale - each 27 centimeters corresponds to 111 real-world kilometers. It has become a popular family attraction in the Viborg area, as visitors take the opportunity to play minigolf along the shore and paddle rowboats in the miniature Pacific Ocean. It’s certainly a charming site, and an Atlas Obscura if we ever saw one. This Danish park has celebrated the American independence day since 1912. Nearly 40 miles and 1,000 years of limestone mines under Denmark. In legend, this ancient dolmen was said to have been created when a troll tried to destroy a church. A tiny park off the beaten path covered in ingenious scrap metal sculptures. A series of eerie metal stick figures are spread out over four square miles on the bed of a huge salt lake in the Australian Outback.